Affiliate marketing is a risk-free marketing channel that your restaurant should begin considering as a way to increase sales. Specifically, your restaurant has a huge advantage of localizing your “affiliate” marketing program to target customers in your neighborhood. 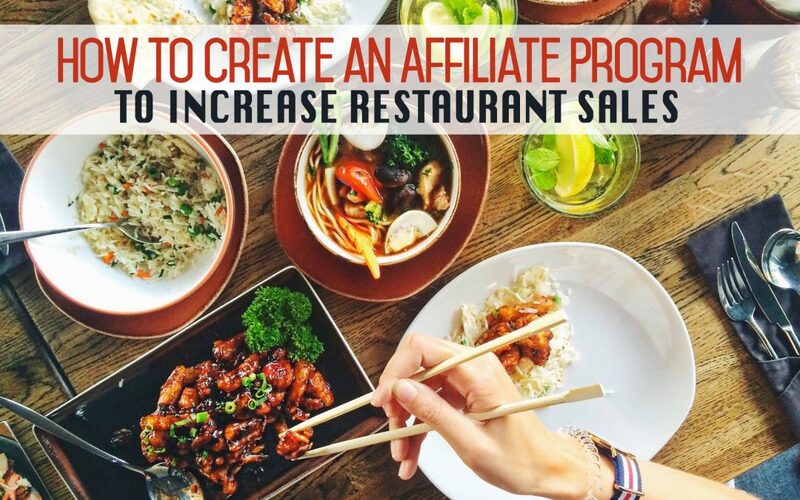 While we don’t recommend building a fully-comprehensive affiliate program (hence the “air quotes”), we will encourage your restaurant to get creative using outside resources to build your sales! Running an actual affiliate marketing program takes time and involves a lot of operations and processes. However, these small tweaks and suggestions will give your restaurant the opportunity to compete against third-party portals by drawing customers indirectly to your own website through other local websites. Since 2015, revenue from affiliate marketing programs grew by 10% annually. The projections are this impressive trend to continue at least until 2021. Work with a local blogger to promote your restaurant. Before you approach them about an affiliate program, first create a close relationship with them. Give them discounts on your food. Have them be a taste tester for new menu items. You can set up an affiliate program specific to them and give them 10% of sales that were generated or referred to you from their website. The food blogger wouldn’t have to do much. Maybe the two of you could agree upon a post specific to your restaurant that included an “order online button” (a call-to-action that is easily trackable). You could also leave a permanent vertical banner on their webpage that would allow you to track where your online orders came from so the blogger could receive their appropriate monthly commission. The affiliate relationship with a local influencer could be set up the same way as the food blogger if they have a website. However, in an effort to expand your outlets, try to find someone local that has a big social media influence in your community. Around 38% of marketers call affiliate marketing one of the top customer acquisition methods. You’re looking for someone who posts actively on Facebook, Instagram and/or Twitter. For your influencer, you could create a one-time-only discount code that they can share to their followers (i.e. a local coffee shop – wants to support your donut shop, so the provide a code DONUTS4U to their customers to encourage customers to buy baked goods from your restaurant). The discount code would obviously only be used by those who are engaged with that influencer, which makes tracking the conversions easy for you. Going this route also allows you to bring onboard multiple influencers to your affiliate program. Again, like the food blogger, you can offer a commission of sales for every discount used. Going this route is easy as pie as long as you find a local site that wants to support your business. Most cities have a website specific to their area, whether it’s a local newspaper’s site or a fun casual local site that updates events, festivities, and “what’s hot” in the area, etc. Work with these sites to get a static online banner posted on their website. Again, much like the food blogger site route, you can offer a percentage of total sales generated by referrals. . A survey done by Forrester on behalf of Rakuten Marketing reveals that 94% of publishers use two or more affiliate programs. Since all affiliate participants are different, 39% rely on three separate networks to procure products and earn commissions, while the hefty 20% work with five or more affiliate marketing companies. The more people you get on board recommending your restaurant, the more success you will see. Continue to present the program to participants as risk-free, no charge, and free of any obligations. Work with your website developer or your online ordering tool/service to create unique affiliate links for everyone. Create a simple one-pager to distribute to your affiliate participants that include their special link or code and encourage them to post on all appropriate channels (website, Facebook, Instagram, Twitter, etc.) and you’re set!